It was weekend she likes to spend with kids take them out somewhere along with cady and rina. So she was expecting them soon. But ram! she knows he will never say no to her, he will accept cady n rina's responsibility too. She opened her old email, there is flood of mails from karthik asking her to come back. Her eyes caught a subject "di jiju" she read the mail! She acknowledged that she misunderstood ram that he did not search her but he could not. she rushed to him who is sleeping. she sat beside him,feels the pain went through, he met with an accident so he dint reach her not that ignored her. she din't even hear her heart which always warned her he is right. she caressed his hairs saying to herself I love u so much. Smile creep-ed her lips, biting her lower lips she recollected the same old days when she braked the cage that she built around her. Insecurities came in front row and fear of loosing each other preoccupied them.both did not realize where was this jealousy taking them She cried her heart out in the closed room, she felt smashed feeling in side her heart. Her insecurities raised, she felt because of her inability to express herself she is loosing ram. she feel that he is not in love with her any more so he move around close with others. she din't respond to him as she was sleeping after a huge torment. Days passed without menial conversation. He i.s busy and she confirmed it as ignorance. Emergency from home made him restless, he called priya into his cabin to inform her about dadi's health and his presence in India. "priya tell joe to book me a ticket to India…" before he say y was he going to India. " sorry sir, If am not wrong am not ur PA. I think u called the wrong person, its ok sir I will call her so that u may be comfortable conversing with her" he is annoyed with her " what is this priya I wanted to inform u that I have to go .. my presence is needed there." " off course sir, so what I mean is u better inform to those who miss ur presence.. I will call her" he shouted "wait…. R u saying that I mean nothing to u!" she looked back and went from there. He was terribly hurt he felt like he loved a girl who is rock heart, still he justified she is his only love. He reached India leaving his heart with her, he gulped raw liquor which burned his throat. He was thinking of her she seems to be his forever and feels equally possessive of him then y the hell she cannot accept him. KK came to talk with ram abt his marriage. She expressed dadi's wish to see him married. He is wounded the same time breaking the glass in his hand when kk expressed her wish to have priya as his wife,how much she miss her at NGO n how much dadi likes her. Kk dressed his wound and said she has met Shudir ji recently n his had a stroke after priya went away. 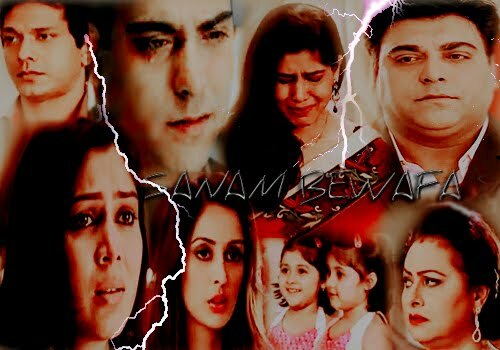 Priya was equally missing ram. she was used to him in every way. She wept her loneliness. It was killing her every sec. His thoughts are those keeping her alive. She stopped to take care of herself. She became the same gloomy priya again. When joe was about to call ram to inform abt priya ram called him, he asked to take care of her till he come. Nisha packed her things to their apartment they forced her to stay with them she said yes after much obligation from their friends. Nothing is able to conceal ram's presence. She said to her heart she has hurted him so much. she realized her life without ram is hell. He decided to speak him her heart so was expecting his call her ego is not allowing her to call him as he dint say what was the reason of his journey. Same time she is worried of the old and young of the family she prayed for all their wel being. Nisha called out priya to lift the desk phone, she was right it was her ram. she rushed to the desk phone. his voice tempestuousness in her, she cried hearing him. he could hear her gasp's between her cries. He smiled for her child like nature. He called her name many times and had no reply. he said " hope ur still angry on me ! am disconnecting the call" her senses came alive and she said "no". the conversation went casually. He informed her abt her fathers health. He asked her to call him. if she hesitate to disclose her identity he asked her to call from his office desk phone. he convinced her to call her papa despite of her fears. She said yes.. he also said it was dadi for whom he was there. everyone is missing her especially KK and dadi who thinks her as bahu. When he is abt to hang, she asked him to come soon but could not admit she was missing him. he smiled and said 'soon'. He smile after few days. Kk observed it.. asked ram who was it. He smile and said " who else maa.. ek pagal ladki." both mom and son shared a lite talk. KK felt happy how small gestures of priya can handle her sons anger.she pray to god for their happiness. She went to ram's cabin which is locked. Only priya knows the passcode. Jackie was suppicious how did priya knows his passcode! "priya u cannot enter ram's cabin its password protected n need his thumb impression" to her surprise cabin was open, " Its open, Dnt strain ur nerves thinking how could I" she entered in and closed the cabin called shudir ji. She cried her heart out speaking to him. she miss her father. She felt a hand on her shoulder. she turned back to see who it was! Nisha consoled her. She used ram's rest room a small room attached to his cabin,no one every had a glance of this room. She saw their pictures and her pic in the frame which encarved 'MY LOVE'. She cried seeing all that. She kissed his image and blushed looking at the imprinted lipstick mark. She decided to confess him soon he reach. She felt fumes of jealous from jakie, priya gave a bad stare at her thinking [haddie in my life, don't know y she wants to come in between me and ram. sometimes I feel like she is a spare part of a vehicle. Let him come! Will ans her in my way.] she continued her work feeling lite as she spoke to shudhir ji. Priya is unaware of ram's arrival nor the worst thing that is going to happen for her. She is waiting for ram to tell her feelings to him. it was Ben who tried to propose her, she was about to walk off he hold her hand and stopped her. Her bad luck joe n nisha were not there. Jackie who has planned this was cheering up ben. priya was struggling hard to get off his grip. She soon felt bens grip loosen, and every one's stared pointed to something behind her. She turned back with tears in her eyes she rushed to him leaning on his shoulder, she could barely utter a word. He moved back, and left to his cabin. She felt dejected,she never experienced this behavior from ram. ben n Jackie took the opportunity and started talking against ram "Common priya its the ram kapoor, he might have had many girls, its time you stop luring for him. see what happened" it made her cry more. He called every one to the cabin to invite them for a party on the success of their project. His voice indicated his anger, the ruthless business man conquered the lover in him. he warned he don't want any mess in his office,he even warned Ben for what happened he will fire him if it repeat's again. He saw tears in her eyes which wretched his heart. He asked her to stay and remaining left. "accha laga.. how was the touch?" " ram I don't know he is upto this trust me"
"haan how could u know ..u don't want any one to know our relationship… is that for this?" " ram plz. Dnt say that. Its not like that"
" its not like that? Then how was that, u should have told me on face that u don't love me! I was a fool still thinks u love me!.. go have fun with ur lover boy I was stupid to come here thinking u miss me! u need me! its something else here.." he hit his hurted hand hard on his desk. It started bleeding again.priya was abt to touch his hand he spanked it back.
" ram … I was not aware of the happenings, I was waiting for joe n nisha I dint knw this was planed. Believe me.. I still . love…. [she could not continue because he called Jackie on intercom]"
" come with first aid kid"
Priya wiped her tears seeing his negligence, Jackie gave a victorious smile seeing priya's defeated stood there silently seeing him .he dint allow jackie to touch him too. He manged to dress himself. Priya took initiative ram kept quite, she tied the bandage tears dropped on his palm. She said sorry quietly and left the place. He instructed not to disturb him. he entered his private cabin. He recognized he over reacted. She realized it was her fault. Her inability to express him her love. She felt she may not be able to say those words to him. joe met ram. ram realized hw badly she felt alone without him, he came to know that she was waiting for him to com to confess her love to him. ram felt bad for his behavior. His eyes captured the mark on his photo. He smiled she did this, he missed to she her blushing face while doing so. He felt sorry for his rudeness. He made up his mind he cant let her go this time. Bell fell on the door disturbed her thoughts. He stirred in bed and was pleased to see his wife with smile on her rosy lips. He caught her hand and wanted to feel her presence for while more, hmm they r parents now pihu jumped on ram. riya ran to open the door priya has to pull herself off to see check riya. Pihu even ran after mummy to riya as opening the door is a game for them. Riya opend the door and ws shivering at the sight. She was scared. Cady came to riya stood beside her riya hugged herin fear. Priya rushed seeing riya's behavior. Priya called pihu who is smart and asked her to handle her sister. Priya knows only pihu can connect well with riya in such situations. Riya went inside with cady and pihu. Pihu hugged her sister consoling her. Pihu want to do some thing mischievous, as her sister is crying because of guest. Priya took a deep breath n blocked the path for the guest to enter. Because she din't has not invited her. It was Ayesha. When priya was about to close the door Ayesha called out " didi".. oh she remember me as her sister priya thought. Priya can ever expect some polite replies from Ayesha except those days when she pretended to ruin raya's relation. Priya nodded negative thinking she will never change when she heard " u r my husbands first wife so ur my sautan n didi right". priya felt sorry for her self to call Ayesha her sibling. She want to cut short the crap with Ayesha. P : y were u here? A: to meet my husband. A: Di i know ram is here. He is my husband u cant say this to me. P: ram is my husband still. He loves me. let me tell u something as long as the first wife is alive and not divorced… do I need to explain u that this is illegal!! P: have no clue abt ur husband so better file a complaint that ur husband is missing. At least then ur cheap trick on ram will come alive. Ram over heard the conversation of ladies smiled at his sherni. She gave a naughty smile n want to play with her emotion. He only knows the result of his teasing. He loves it. More over he promised his babies to help them. ram looked to peehu and winked..
"sugar free.. madam on diet.. aur yeah ram , don't even know how many spoons of sugar do I take.. leave it priya if he is that concerned abt u he will make coffee for u like he used to. He don't like u any more ,I have to live for ur babies, now they have their papa so I am little relaxed what ever happens to me.! hmm ram does not know my problem even .. after all life is short .. it better he return back to KM"
Ram is behind her from the beginning of her blabbering. She felt hot breath on her neck, and then his cold fingers touch her bare skin on the crook of her neck… he hold her shoulders leaned close to her said.. "I want to prepare coffee for my wife n me u prepare one cup its enough as we r three here." Priya could not control tears in her eyes they rolled down he eyes and fell on rams hand which circled her shoulder.